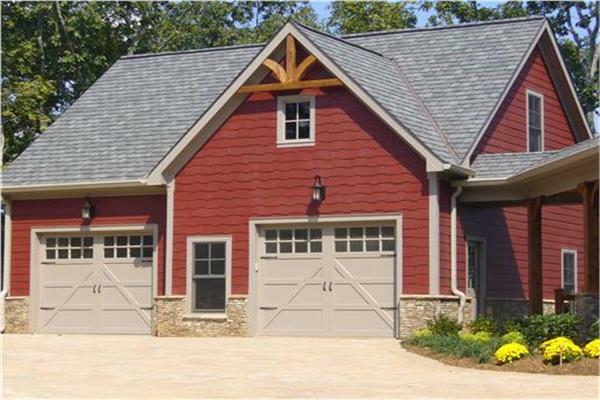 Both functional and customizable, garage plans with apartments typically consist of a freestanding structure, separate from the main home, beginning with a space on the ground level for storing one or more vehicles. Above this area rests a fully functioning living space, which usually includes a kitchen and bathroom in addition to living and sleeping spaces. The number of rooms available in the living space floor plan varies depending on the size of the building and the lot of the main home, which can lead to apartments ranging in size from studios to three full bedrooms. If the garage is already in place, detached or connected to the home, the full floor plan layout of the apartment may vary somewhat. These plans are common choices for parents with college-age children, as it allows them to live at home while attending school or have their own space while still staying close to the rest of the family. Similarly, a garage with an apartment is a frequent choice for homeowners who need to have elderly parents move in with them. Because the apartment space is so removed from the main home, it allows the older occupants to retain a greater level of independence despite the change in living arrangements. Garage apartment plans are also a great way to create a dedicated space for overnight guests, as it allows them access to their own private space and their own bathroom so as not to inconvenience the other residents of the home. Browse through our plans below, and contact us with any questions that you have. Our team is happy to help!